Abortion is typically a pretty heavy topic, one that can be quite contentious. 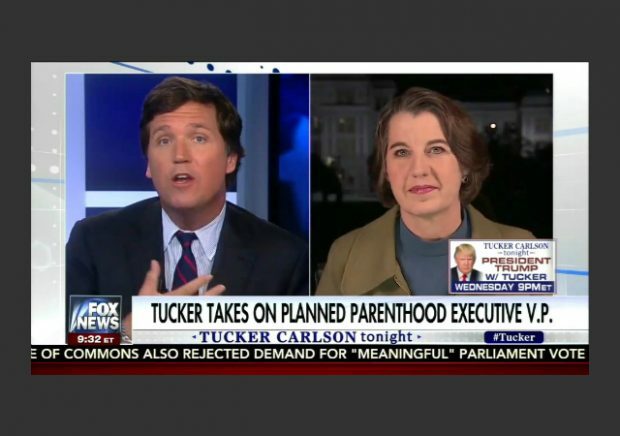 But when Fox News host Tucker Carlson debated a Planned Parenthood executive, he had quite a different experience, calling it a ‘uniquely shallow conversation’. Dawn Laguens serves as an executive vice president for Planned Parenthood, the country’s largest abortion chain. They provide over 300,000 abortions each year. Yet when Tucker Carlson asked her about the basic scientific facts of human life, she was unable to give any substantive answers. First, Carlson asked why abortion was so important to Planned Parenthood that they were willing to forgo taxpayer funding rather than stop performing them — half a billion dollars each year, specifically. She replied that “no one is going to bully, threaten or bribe” Planned Parenthood, and then said, “We don’t get a big check. We get reimbursed like any hospital for providing a pap test or a breast cancer screening.” So Carlson asked her why they don’t focus on preventative services instead of abortion. “Women deserve access to the full range of reproductive health care and that includes safe, legal abortion,” she replied. And throughout the interview, she refused to answer the question of whether or not abortion takes a life. Of course, Planned Parenthood can’t acknowledge that they’re taking lives every single day. That wouldn’t help them rake in the blood money, would it?